The area’s nature-first community, TrailMark, proudly welcomes Dream Finders Homes and Lennar Homes to its family of award-winning home builders. Both builders are building new model homes, with one decorated model opening this summer. The Jacksonville division of Lennar Homes has broken ground on its new coming soon community, Mill Creek at Kendall Town. The community located in Jacksonville’s Arlington area will offer single-family homes priced from the high $100’s. Lennar Homes is offering luxurious yet affordable living at its community of Coronado in St. Augustine. 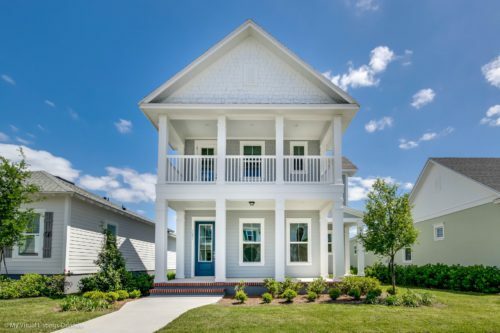 The community offers beautiful single-family homes surrounded by nature and a convenient location near St. Johns County schools, shopping, dining and employment centers. If you are in the market for a new home and looking for a gorgeous community with an extremely convenient location, look no further than Lennar Homes’ Glenlaurel Estates. The Mandarin community is a rare gem with upscale family-friendly homes within easy distance of everywhere you want to be. Lennar Homes will celebrate the grand opening of its newest community, Lakeside at Nocatee Town Center, on Saturday, April 20. The public is invited to attend. Visitors will enjoy refreshments and be among the first to tour Lennar’s fully furnished new model homes. The Jacksonville division of Lennar Homes in partnership with FloridaFallenHeroes.org is presenting the Fallen Heroes Golf Classic on Friday, March 15, at Eagle Landing Golf and Country Club at OakLeaf Plantation. Have you seen the new Lennar Homes Bordeaux model at Coronado? Lennar’s newest community in St. Augustine features beautiful homes surrounded by nature and a convenient location near schools, shopping, dining, and employment centers. Lennar Homes new Genesis model home is now open at Eagle Landing at OakLeaf Plantation. Lennar’s model showcases the company’s Next Gen – The Home within a Home and accommodates one of the top trends in the housing industry – the comeback of multi-generational living. Lennar Homes has opened its Merlot Bonus model home at Glenlaurel Estates. Lennar’s newest community in Mandarin is a rare gem with gorgeous new homes and an extremely convenient location, making it possible for homeowners to get away from it all while being near it all. The Merlot Bonus plan features more than 3,400 square feet of living space with three bedrooms and three baths.